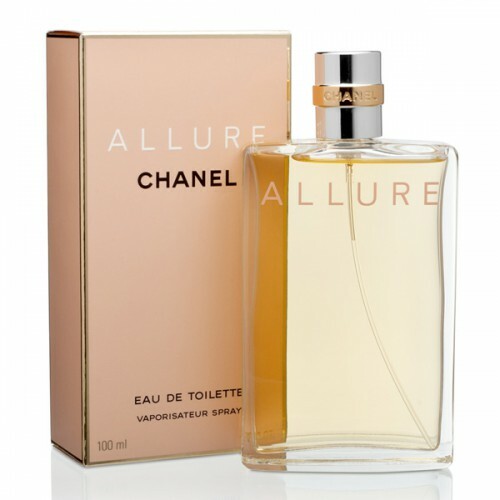 Chanel Allure EDT is suitable for celebrations, parties & ordinary working days. Chanel Allure EDT 100ml. was designed for women who know what they want, they are confident and elegant. Fragrance combines sensual tones and attractive, based purely on the nature of each woman. As each perfume Chanel, this conceals a magical charm, combined with the beauty and luxury. The fragrance opens motives fresh peaches and sweet mandarin. Then passes into gentle water lily flower tones, luscious roses and jasmine. This pure and captivating essence is topped with woody whiff of sandalwood laced with vanilla and vetiver. The world-famous and popular brand Chanel is famous not only in the fashion world, but also offers exclusive perfume for every woman. It is suitable for special occasions, but also for everyday wear in any season. Flair and elegance adds Allure scent and modern design of the bottle. The perfume was in 1997 FIFI award as the best perfume of the year. Celebrate uniqueness Chanel Allure perfume, which gives you sparkle and perfectly complement your every outfit. What should be the perfect perfume? Some women choose for themselves something unusual, subtle, alluring, while others prefer fresh or sweet flavors. It would seem that you can not pick up the scent, which would have liked everyone, but a great house Chanel has created a unique flavor Allure, which fascinates with its beauty is absolutely all. In his initial notes of freshness you can hear the lemon and the sweetness of vanilla bourbon. After a few moments, the perfume will reveal to you the ease of flowers Passiflora, mandarin and incredible vetiver. Piercing and alluring train behind you will follow a May rose, peony and jasmine. Of Allure pleases the owners of incredible durability and beauty. Its flavor can not be forgotten, it is unique. Allure can be worn every day to work or sometimes to please those around them on major holidays. It is suitable for celebrations, secular parties and ordinary working days. Allure - tenderness and sensuality spring flowers.